* Swiss swoop on Khadem’s cars – total value RM200 million! PUTRAJAYA (AP): Malaysia’s Government will sell much of the huge stash of jewellery and luxury goods, including diamond necklaces, tiaras and designer handbags that were seized in a money-laundering probe of former leader Datuk Seri Najib Tun Razak, Finance Minister Lim Guan Eng told The Associated Press. Police said 12,000 pieces of jewellery, 567 handbags, 423 watches and 234 sunglasses were confiscated last month from properties linked to Najib after the shocking electoral defeat of his long-ruling coalition. The police estimate the haul, the biggest in the country’s history, is worth over US$273mil. Lim told AP in an interview Friday that the Government will “try to monetise whatever we can”. He said the amount is a drop in the ocean compared to some RM50bil (US$12.4bil) of losses related to the defunct 1MDB investment fund set up by Najib, including from alleged outright theft and loans used to conceal the graft. “We will try to monetise whatever we can, but bear in mind it is nothing compared to the amount that has been robbed from the state,” he said, adding he was stunned by the police seizure. Malaysians have reacted with disbelief on social media at the extensive stash that included 2,200 rings, some 1,400 necklaces, 14 tiaras and thousands of bracelets, earrings and brooches. Najib has claimed most of the items were gifts from foreign dignitaries over decades and said the police valuation was grossly inflated and appeared to be a “political vengeance” against his family. “Imagine if that amount was discovered or revealed in the United States, it would be mind boggling even for a country as wealthy as rich as the United States,” Lim said. For a small country such as Malaysia, “it is completely out of this world,” he said. Najib set up the 1MDB fund when he took power in 2009, but it accumulated billions in debts. US investigators say Najib’s associates stole and laundered US$4.5bil from the fund from 2009 to 2014, some of which landed in Najib’s bank account. They say US$27.3mil was used to buy a rare diamond necklace for his wife, Datin Seri Rosmah Mansor. New Prime Minister Tun Dr Mahathir Mohamad has reopened investigations into 1MDB that were stifled under Najib’s rule, and barred Najib and his wife from leaving the country. Dr Mahathir, previously prime minister for 22 years until 2003, was spurred out of retirement by the 1MDB scandal. Anti-graft officials have said Najib may face criminal charges soon. Lim said allegations that surfaced in 2015 that some US$700mil from 1MDB was channelled into Najib’s bank accounts were the “game changer” that prompted Dr Mahathir, 92, to work with former foes including himself and others who were jailed during Dr Mahathir’s first stint as leader. “I said no one is so stupid to put money into his own personal bank account especially if you are dealing with the prime minister. Who is stupid to do that,” he said. “Imagine if they had won another term, the glass would be empty,” he said. 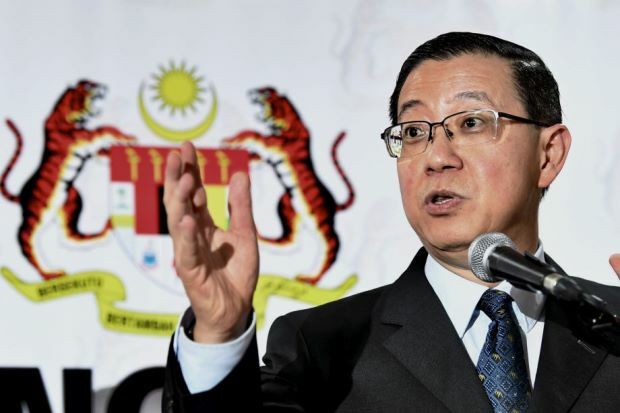 Lim, who recently revealed graft in some projects linked to 1MDB after opening up access to files in the Finance Ministry previously limited only to a top few, said he believed most of the mega scandals have been uncovered. But he said there are many “mini 1MDB” scandals on a smaller scale that will be revealed over time. Dr Mahathir is expected to hand over the baton to reformist leader Datuk Seri Anwar Ibrahim under an election pact after they agreed to bury a two-decade feud. Anwar’s wife, who is currently the deputy prime minister, will step down at the time, Lim said.